Drivers fatally struck two seniors in separate crashes in Manhattan in the last few weeks. NYPD filed no charges in either case. On August 23 at around 3:50 p.m., 85-year-old George Mamalas was crossing W. 93rd Street at West End Avenue when someone hit him with a box truck. NYPD told the West Side Rag that the driver was westbound on 93rd, which is one-way, and turning left onto West End. Mamalas died from his injuries on September 11. His obituary says he was a Korean War veteran, dancer, and Pilates instructor. There is no dedicated turn signal at West End Avenue and W. 93rd Street. If the driver had a green light and Mamalas entered the intersection with a steady walk signal, Mamalas would have had the right of way. NYPD did not identify the driver, which is typical when police don’t charge or ticket a motorist who kills a person. Drivers have killed at least five people walking on West End Avenue since January 2014, according to crash data compiled by Streetsblog. Following a string of deaths, beginning with the crash that killed 9-year-old Cooper Stock, DOT implemented a road diet along 35 blocks of West End Avenue in the fall of 2014, but installed concrete islands to slow driver turns at just four intersections. W. 93rd Street wasn’t one of them. George Mamalas was killed in the 24th Precinct and in the City Council district represented by Helen Rosenthal. 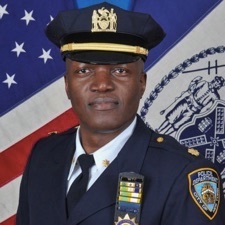 Deputy Inspector Clint A. McPherson, commanding officer of the 19th Precinct. Motorists have killed at least six people walking in the precinct in 2016 as officers crack down on cyclists. A motorist in pursuit of a parking spot fatally struck Lee Strong, 83, at approximately 10:40 a.m. last Saturday, September 17. Strong sustained head trauma and died the next day at Cornell Hospital, Gothamist said. Vincent Downing, 85, was killed at the same intersection last May by a driver who backed into him, pinning him against a second vehicle. Lee Strong is one of six people killed this year while walking in the 19th Precinct, where cops are more concerned with ticketing cyclists than stopping motorists from taking lives, and in the City Council district represented by Dan Garodnick, who has enabled the 19th Precinct’s complaint-based enforcement practices. From what I’ve heard, bikes are a big problem. Bikes rarely (like….rarer than people dying from taking selfies) kill anyone. Cars? All the time. Bikes aren’t the problem. Sounds like they’ve got their priorities WAY out of wack if they’re worried about ticketing cyclists, who have killed no one, while letting drivers who kill pedestrians go free. Those 80 year olds Are just so spry These days – able to dart into Motor Traffic at Olympic Sprinter Speeds. Those poor cars, Imagine how Those Cars feel after being forced to kill. Cars are a big problem. Seriously, though, I am not against all bicycle enforcement. I strongly believe that we need to address bad cyclist behavior, both as cyclists and as cycling advocates. That will get the community on our side. But I think that the priorities of enforcement should be on dangerous behavior. In other words, instead of focusing on whether th focus should be on cars or cyclists, we should all push for the focus to be based on the violations- a big push on speeding, recklace operation, failure to yield, etc. If an officer sees any road user doing such, they pull them over. If they see both a car and a cyclist failing to yield, then obviously they should pursue the car over the cyclist. If we, as advocates, went with this frame of mind, we would get more community support. Now I realize this is hard because the cops don’t handle it right. But if the big advocacy groups pushed these, maybe we could see some top down pushes from NYPD to do it right, which could help the buy in from the rank and file. I, for one, am a cyclist who gets really irked when I see another cyclist cut too close to a pedestian, or salmoning, or riding on the sidewalk in Manhattan. plz plz plz let this turn up on youtube…. I’m glad we are now naming and shaming the accessories-after-the-fact to these manslaughters. Garodnick and McPherson, conspirators in killing. It’s unlikely that the red arrows is the correct route, because it turns too sharply at the end for a car moving fast enough to kill someone. Anyway I would suggest curb extensions like these to prevent this kind of tragedy in the future. As cyclists, we’re losing hearts & minds of people who are our natural allies.